Minnesota, the newest state in the Union, became the first to send volunteers to fight in the Civil War. That “first” perhaps marked the beginning of Minnesota’s ongoing reputation as a very citizen-participatory state. In 1861, President Abraham Lincoln put out a call for troops. Shortly after that, MN Governor Ramsey volunteered 1,000 men to defend the nation. 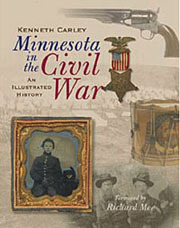 Ramsey’s plea was answered by 262 men, many new to MN or new to the US, and the First Minnesota Volunteer Infantry Regiment — comprised of farmers, loggers, clerks, teachers, students, and lawyers — was formed. The volunteers were young, mainly in their late teens to mid-twenties, and some had not had time to even become U.S. citizens yet. Of the 262, only 47 volunteers came home.